This article will argue for a different way of doing industrial politics, based on acknowledging three key problems facing the whole working class, namely: (i) the decreasing proportion of the workforce with union membership; (ii) the growth of what used to be called “atypical” working but is now usually termed “precariousness”; and (iii) the reduction in the number of trade union reps and their increasing age. Through this piece, I switch between three different ways of talking about class: class experience, class feeling, and class consciousness. Class experience is the totality of experiences which causes people to feel that they have interests in common with others. Something which many Marxists have been too slow to grasp is that, while experience in the workplace may be necessary to the formation of working-class consciousness, it can never be sufficient. For when people are united only by their experiences of work, the forms of consciousness they adopt are likely to be sectional (as in the many unofficial, sectional strikes of the 1950s and 1960s) or occupational. The latter can be extremely militant (as in the slogan of 1984-1985: “the Miners united will never be defeated”) but it is not quite the same thing as class consciousness, which is about seeing all workers as your brothers and sisters. It follows that if you are looking to find the people who are going to be the most militant champions of workplace self-activity in future, perhaps paradoxically, you just as likely to find them in other forms of working-class protest, whether against benefit cuts or hospital closures, as you are within the present ranks of the public sector unions. Class consciousness is formed by experiences of housing and education, etc., not only work. Class consciousness is what happens when experience acts on workers’ feelings to produce a practical result. This might be a workplace strike, or a rent strike, or protests against evictions. Class consciousness only exists where it expresses itself through activity. Marx described class consciousness in The Poverty of Philosophy as an outcome of “economic conditions [which] had first transformed the mass of the people of the country into workers. The combination of capital has created for this mass a common situation, common interests” [i.e. class experience]. “This mass is thus already a class as against capital, but not yet for itself” [i.e. there was class feeling but no consciousness]. “In the struggle”, he continued, “this mass becomes united, and constitutes itself as a class for itself.” (http://www.marxists.org/archive/marx/works/1847/poverty-philosophy/ch02e.htm). The common sense of our time is that not merely that there is no class consciousness but even that class experience is a historical phenomenon. Nine years ago, one of the International Socialism Journal’s former editors, Nigel Harris, wrote an obituary for Duncan Hallas, a former leader of the SWP, in which Harris suggested that the entire left had failed to grasp that there was no longer a working class, and that the shared experiences which used to make class a reality had all since been consigned to the past. As a piece of literature, this was beautiful, evocative writing. But as a piece of contemporary analysis, it rested on a series of juxtapositions which do not stand up to close scrutiny. Workers in 1925, it is suggested, were united by their experience of insecure and unsanitary (“slum”) housing as if poor housing is no longer a feature of our lives. Yet insecurity of tenure and high rents are just as much of an issue now as they were eighty years ago. Workers lacked fridges and televisions in 1925, just as fifty years before wrist-watches had been a luxury. This is true, but even as long ago as 1939 most homes had radio, most working-class children could get to see the cinema which was if anything relatively cheaper (at less than a shilling a ticket) than it is now. Class experience didn’t stop of a sudden in 1966, when millions of homes in Britain acquired a television set. The numbers of workers employed in the industries Harris portrays as central to the “massiveness” of working-class experience, i.e. textile, steel, dock work, were not huge: at 300,000, 30,000, and 270,000 people respectively in the 1931 census. Compare the 2.3 million people in Britain who worked in manufacturing in 2011, the 1.3 million in transport, or the one million or so who work just in call centres. Workers’ experiences in the workplace and outside remain sufficiently similar to explain why it is that (as many articles in the ISJ have pointed out over the years) the number of people describing themselves in surveys as working class is no less than it was 20 or 30 years ago. Class experience and feeling have not diminished; the problem is rather a lack of class consciousness. To understand why there is a problem of consciousness, it not enough to talk about the political strategies of capital. Ever since capitalism took root there have people who were determined to break what they saw as the power of labour, and politicians ready to ally with them. What is more important to ask why these strategies worked, when countless previous strategies with a similar purpose (eg in Britain, the plans of the Heath government) failed. Comrades in the IS tradition have ascribes the very low level of strikes in Britain in recent years to a combination of lack of confidence and restraint by trade union leaders. We have tended to treat any objective weaknesses of the working class (eg precariousness) as the product rather than a cause of defeat. But the greatest of the set-piece defeats in recent British industrial history (the sequestration of the miners’ funds in 1985) happened 28 years ago, more than half the average working lifetime. If the problems were only ones of consciousness, we would have got over them by now. A more useful answer might go something like the following: at each moment in the history of capitalism, there have been waves of technological innovation which have reshaped the entire labour market, by changing the lives of key groups of workers, whose industrial situation capitalism has since generalised. Frederick Engels’ 1844 book The Condition of the Working Class in England, defines the working class, by its relationship to technology. It “was called into existence through the introduction of machinery … The first proletarians belonged to manufacture and were begotten directly through it.” (http://www.marxists.org/archive/marx/works/1845/condition-working-class/). For Engels, the most important kinds of technology were those in the then-dominant factory system (especially cotton manufacture). The point was not necessarily that there were huge numbers of people in Britain working in factories in 1844 (in absolute terms, there were significantly fewer factory workers in Britain than there are today), but that the labour supervision made possible by the factory system was going to be generalised. Chartism (a political campaign, whose primary form was mass meetings rather than strikes) was the clearest expression of their growing class consciousness. In the 1880s, this generation of workers had ceased to be at the forefront of industrial developments. More important were the huge numbers of unskilled workers (miners, dock workers, etc) who dug or transported the coal which powered the “carboniferous capitalist” industrial economy. These workers first come to the fore during the New Unionism of 1889-90. The transition from “factory capitalism” to capital accumulation through the intense exploitation of semi-skilled or unskilled labour was but the first of several transitions: from the heavy industry of the 1880s to the light industry (engineering and car manufacture) which dominated the economy of the 1950s and 1960s and to the service-based economy of the present day. Described like this, what is important about neo-liberalism is not so much that the Thatcher government closed the mines, the steel plants, the docks, etc. but what happened next. Part of the answer is that new employment opportunities eventually came, but they did so at first in areas of the country with relatively low levels of unionisation, and in the circumstances of organised labour’s recent defeat. Job opportunities were at their best in towns like Reading or Swindon with relatively weak union traditions, and their least in Liverpool and Glasgow, etc. Then, there were conscious policies of excluding trade unionists, and of recruiting new entrants to the labour market (eg the young, married women). Plus of course, whole new generations of companies and technologies have been the fastest recruiters; and they have generally been anti- or at least non-union from the outset. The subsequent period of neo-liberalism’s political hegemony has disrupted an entire cycle by which you would otherwise have expected groups of workers (such as nurses, call-centre workers, drivers delivering consumer goods on behalf on supermarkets and online retailers) to have become by now the new faces of industrial militancy in Britain. Various workplace dynamics have accompanied the neo-liberal hegemony. From the perspective of the working class a whole, these are simultaneously “problems” (they are some of our side’s key weaknesses); conversely, if we are going to confront them and change the narrative of working class defeat, at some point we will have to start seeing them as organising “opportunities”. What is being proposed here in effect is a strategic orientation which takes into account where the most important battles are going to take place, not necessarily the easiest to win, but the ones that will make the most difference. A first weakness facing the working class is the demise of trade union density (i.e. the number of trade union members, absolutely, and their numbers relative to the size of the workforce as a whole) and coverage (i.e. the incidence of trade union recognition, especially in workplaces where only a minority of workers are members of a union). Both the number of trade union members and of course the number of strikes are falling. Trade union membership is becoming rarer, only one in six private sector workers in Britain are trade union members, and around half of all workers in the British economy have never been a union member. Of course, at least theoretically it would be possible for trade unions to overcome low density by (as they have, as in France or Germany) making the best of a favourable legislative climate, in which the general right to vote for representation is extended beyond the number of union members into the workplace, so that even non-members can elect militant union reps.
New Labour’s introduction of a statutory process to obtain union recognition in 2000 was half-hearted, and has been largely ineffective, with only around 50 union branches a year obtaining recognition through the statutory process. The result is that only a third of all workers have their pay and conditions are determined by collective agreement. A half of all UK employees are in a workplace where no union is active in any way at all. If socialists are going to be part of changing that experience, then we should be thinking about the sorts of workplaces where it would be possible for unions to recruit large numbers of workers relatively quickly. One obvious determinant would be size: one of the largest workforces in London is Heathrow, for example, with 75,000 workers directly employed, and another 40,000 at least working on jobs dependent on them. If you look at workplaces in terms of their capacity to dominate a local area, it is just obvious that a lengthy strike involving groups of workers at Heathrow would be likely to have a greater effect in terms of winning support among other workers and creating an mood of class consciousness than any strike, no matter how militant, involving but a single primary school. In France, the Trotskyist party Lutte Ouvrière, with whom the SWP briefly had in the early 1970s cordial relations, established itself through a series of practical activities including standing in parliamentary elections, holding a large, annual festival which has been popular well outside their ranks, and by each branch selling their publications weekly outside the largest workplace in their area, the sales backed up by a weekly newsletter, often well-informed, describing the latest twist and turns of union-management battles in the workplace. Part of what defined this practice was its routine nature; to get the information to make the newsletters work, LO needed to have many contacts in the workplace, and to get them, it had to maintain the sales over many years. This is a method the SWP copied, for just about 12 months, in 1995-6, before moving on to other, more exciting campaigns. This was one of those occasions in the party’s history where Cliff’s abiding legacy (our capacity to move, quickly, in the direction of whatever we think will be the next exciting campaign) may not have done us too many favours. If the party is ever again going to have industrial roots, above all in the private sector workplaces where unions are presently weak, we may well find that we need to revisit this same approach of more patient, targeted, industrial work. Another part of what has enabled neo-liberalism to succeed has been its attrition of the employment form. Out of a total workforce of just under 30 million people, 1.6 million people are now on temporary contracts, 8.0 million work part-time, and 4.2 million people are self-employed. These figures have all gone up during the recession (by around 13%, 6%, and 10% respectively); but not only recently, all have been rising consistently over the past 30 years. This experience is far from unique to Britain; where if anything the class has been able to defend more of the 1950s-era model of secure full-time employment than has been protected in Egypt or South Africa or elsewhere. If a worker is employed on a part-time contact, they do not cease to be a worker. Many of the contractual forms of the old occupations of a century or so ago were highly precarious: dockers, chosen daily by their employer, miners, on year-long contracts (“the bond”) which were far more about establishing their duties to the employer than any entitlement to work. But workers on zero hours contracts or in self-employment can find it much harder to organise. A good example of an industry where the hollowing out of employment impacts on workers’ organising opportunities is construction, where UCATT estimates that around half of all workers (c400,000 people) are falsely designated as self-employed. Self-employment makes it harder to organise because it divides up even very large construction projects into multiple discrete units each having formally a separate employer and pits isolated groups of workers against very small employers with no capital savings. Construction has one of the most impressive rank and file networks to be found anywhere in private industry just now, but some of the best-known battles of recent years have been about winning recognition for groups of 20 or 30 union members at a time. These are far from the “solid, immovable, eternal” masses which Nigel Harris found in labour’s distant past. Set-piece strikes by public sector workers against government cuts are unlikely to halt the spread of precarious working. The experiences of the workers involved in these strikes (usually university graduates, predominantly on full-time, permanent contracts, with final salary pension schemes and a high level of union density) separate them from precarious workers. Even in the parts of the public sector which are both characterised by regular strikes and high levels of precarious working (eg universities, where over half of all teaching staff in many institutions are on hourly-paid contracts), what tends to happen is that strikes are conducted by the full-time workers, and the casual staff (not least because they are mostly not union members) play little or no part. 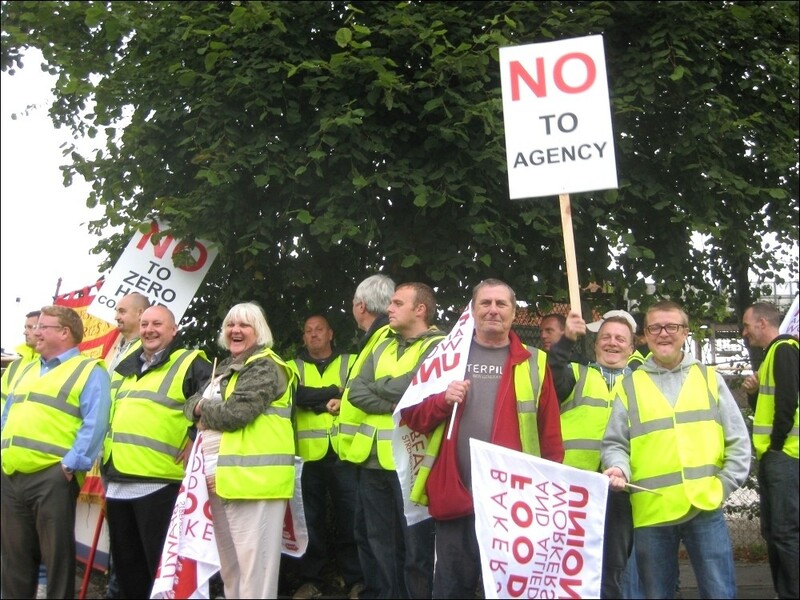 If university strikes generally fail to result in the unionisation of casual teaching staff, there is no reason to think that they will result in the greater recruitment to unions of other workers outside the campus gates, casual security guards, or drivers, etc. And the difficulties are still sharper once you start thinking of the working class as essentially just a collection of journalists, civil servants and primary school teachers. These are the most left-wing unions; they are not the class itself. Neither are they the types of workers who are likely to win the attention or support of (say) call centre workers. If socialists were serious about tackling precariousness, we probably would not start with the lowest-paid and least secure workers (who by definition, are going to be among the hardest to organise and to keep organised), but nor would we begin with workers in the most secure, public sector jobs. Surely, what we would be looking for is groups of workers who share the right mix of experiences with precarious workers, so that their strikes could engender a dynamics of class feeling, and then of class consciousness. For example, if you wanted to get strikes by private sector cleaners, not a bad place to begin would be groups of workers like London Underground cleaners, who although precarious, work in proximity to other, secure and highly-unionised workers. If you wanted to get strikes among call centre workers in the private sector, you might look for call centre workers employed by government departments, who have the advantage of proximity, this time, with well-organised PCS grades. I am certainly not suggesting that members of the SWP have kept aloof from these two groups, the campaigns of each of which have been covered by Socialist Worker; and there was a Call Centre Worker magazine which was published intermittently for a couple of years until 2010. But we have tended to focus the efforts of our full-time apparatus rather on the most secure public sector workers. A mere numerical assessment of the number of leaflets we produce each month would show that we are consistent only about different kinds of workers, chiefly in the unions where we have greatest “influence” with the leadership (i.e. NUT, PCS, UCU). For decades, we have not had a plan for contributing to the organising of precarious workers. A third weakness of the working class in general and the trade unions in particular has been the tendency for the number of trade union reps to shrink, in tandem with the declining number of trade union members, and for the age of trade union representatives to rise. There are presently a little under 200,000 trade union reps in Britain. Union representatives tend to be male (56 per cent are male), surprisingly old (78 per cent are 40 or over, and the average age is 46) and employed on secure contracts (92 per cent are full time employees). In addition, black workers are under-represented: 4% are black compared to the overall black and minority ethnic population of around 16% (this is especially troubling when you recall that black people are statistically more likely to be trade union members). Any Marxist party worthy of the name should be asking itself anxiously whether it merely reflects these dynamics of segregation, or whether it is challenging them, in particular by training a new generation of reps. Certainly, at every stage when the left has grown noticeably, this has tended to be reflected in a recruitment of new generations of shop stewards and workplace activists. This happened with the rise of syndicalism in 1910-1914 and 1916-1919, with the wartime growth of the Communist Party of Great Britain (with the CP actively encouraging its members to become union reps in post-war industry) and again for the IS and others after 1970. All these parties held specific training events aimed at new reps; often they were livelier than anything which the unions could match. The regrowth of the left should result in greater numbers of working-class activists, including union activists (if not, why do we recruit people to left-wing parties?). But this least likely to happen in a party which flatters and always pushes forward long-standing trade union reps in their fifties over the future reps who are now in their twenties; or one which seems capable of imagining working class protest only in terms of victories by the existing trade unions which young workers have fewer and fewer opportunities to join; or one which increasingly limits its analysis of trade unionism to the “left” public sector unions which are less and less typical of the union movement as a whole. What might an upturn look like? At some point there will again be a rapid revival of trade unionism in Britain. When it comes, it will certainly not look like the industrial protests of the early 1970s (as these took place in industries which had behind them the immediate memory of 15 years of repeated, local, sectional, strike activity); nor, in all likelihood, will it resemble the postwar, quasi-insurrectionary strikes of 1919 (in which a significant role was played by groups of workers who had been made almost un-dismissable by their importance to the war economy); or the Great Unrest of 1910-1914 (which saw the rejuvenation of networks of trade union activists, shaped by a previous wave of mass strikes, followed by relative quiet for just a bit less than two decades). The next economic upturn may look quite a lot like New Unionism, when the “old”, skilled unions which had dominated the TUC for 20 years (eg the engineers) played little part, while the newest and most militant part was played by workers in industries which were previously considered un-organisable because of their economic precariousness (ie dockers, gas workers). 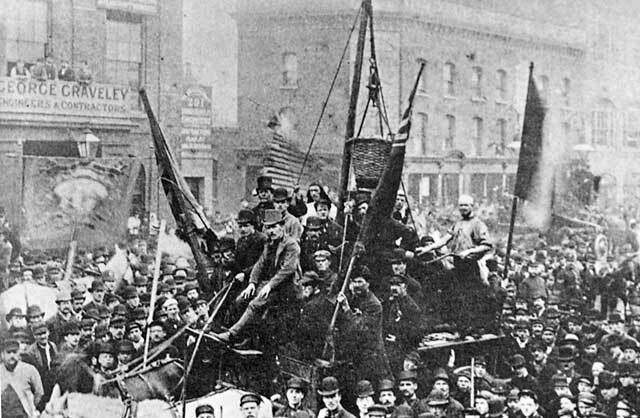 New Unionism took place after a period of five or six years in which Britain’s first socialist party the SDF had organised, sustainedly, among the unemployed. And a disproportionate part was played by socialists who had recently been recruited to the SDF and were influenced by it. For the dockers and the gas-workers, imagine call centre workers, the drivers who deliver online purchases, workers in the huge out-of-town retail factories; they are our generation’s potential equivalents. But if that sort of upturn is going to happen, the best preparation for it would be a wholescale junking of the present industrial perspectives of the left; a move away from the public sector towards the private, the targeting of workplaces, and a deliberate searching for groups of workers who are located at the crucial boundary between security and precariousness. In a society where four-fifths of adults did not go to university, you cannot base a strategy for working-class self-emancipation simply on recruiting students and hoping they go into the graduate unions. Where you do this, it leads to a serious misunderstanding both of the main currents of trade unionism, and of the main dynamics of working class life itself. Changing this deeply-ingrained habit will take time, and can only happen by a subtle reallocation of priorities, by the identification of opportunities, and the patient cultivation of key workplaces and working-class activists. If any readers are serious about helping the British left get back to what was once assumed to be its defining purpose, it is worth recognising that any serious trade union work just takes lots and lots of time. It is all about identifying the space which is right for you, and then working there consistently, whether that is as a rep, or as someone standing outside the workplace with some leaflets and a collecting tin. There are no short cuts.